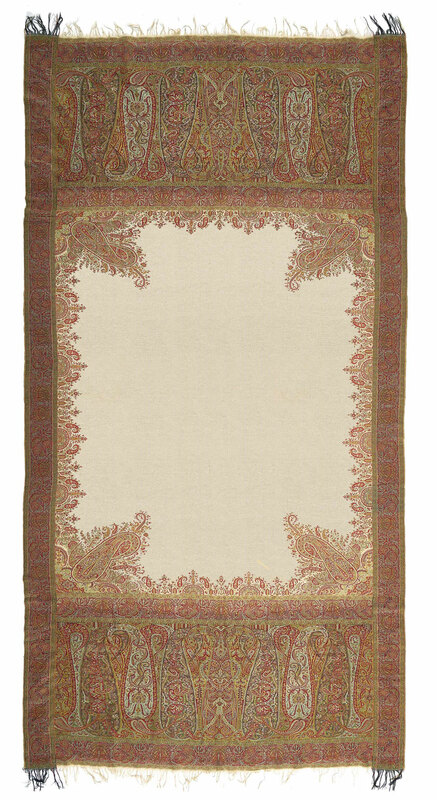 This exquisite shawl displays a streamlined and impeccable design flow of large butas on a floral mosaic background. The Kani embroidery work in this shawl showcases the virtuosity of Indian craftsmanship. This specific lot was cut from more than one larger shawl and has considerable seaming. The colour palette adopted in this shawl annunciates continuity in terms of hues and composition. While the Tan seam anchors the shawl in its entirety, the mid panel design inculcates an aura of visual extravagance. Plain Khudrang pallavs added. This lot has been assembled from 2 different shawls, and displays considerable seaming. The design pattern is composed of depicted butas on the abstracted floral background. The thread work has been executed in Kani embroidery technique, the shawl is texturally replete and culminates with rich navy-blue pallavs. Cut down and assembled from 3 different shawl, with considerable seaming. The technique for the exquisite thread work is Kani while the exact type of design is that of the Jacquard school. Intense maroon pallavs have been incorporated in this lot. The densely ornate green border has an individual and well defined floral mosaic pattern which is disparate from the field section’s motif. Cut down from a Jamawar piece with no apparent seaming, this quaint shawl’s design composition is intricate considering it features small butas against an abstracted floral background. The clustered momentum that resonates to the surface owing to the myriad of butas gets harmoniously neutralized in the shroud of the shawl’s earthy colour palette. Also incorporated are Khudrang pallavs. The colour composition reflecting in this work is a major highlight of this piece, considering it effectively instills the aura of royalty and opulence modestly. The multiple butas of floral background and the applied Kani technique are important aspects of Kashmiri textile traditions, which have been captured by the artisans through this work. The borders are stripes of white and browns and neutralizes the momentum of the embroidery work executed. The tan centre field is void and imparts space and are for the motifs to resonate to the surface. Cut from a single larger shawl with considerable seaming, this lot is adorned with a subdued design pattern. The Badamdar Kani embroidery work with a dark hued composition is balanced with the incorporation of a much softer Tan colour seam. The deftness of execution, and sheer momentum of craftsmanship observed throughout this shawl is overwhelming and represents the textile traditions of Kashmir. Observed is the addition of plain Khudrang pallavs. 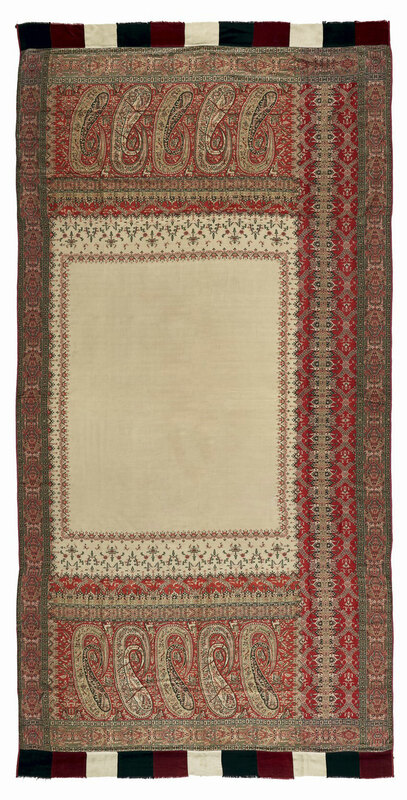 This lot is adorned by antique borders and pallavs patched onto plain white Pashmina wool. The technique of application is Kani with the design ergonomics are crafted with large butas on abstracted floral background coupled with a subdued palette. 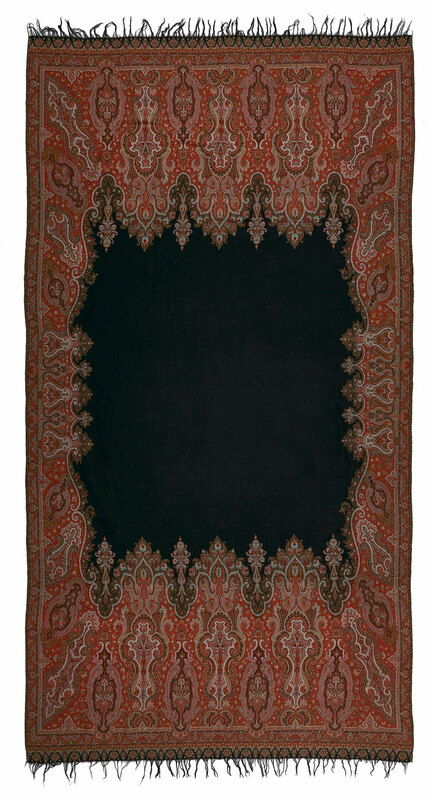 This shawl was cut down from a larger shawl, with the addition of a plain Red pallav. The Kani work in this lot had been carried out with an extended colour palette such as Red, blue and off white. Therefore the featuring large butas on abstracted floral background propel to the fore with a disruptive disposition and each buta achieves an individual visual attention. This lot is a single piece model and features moderate seaming. The design aspect is that of ‘Dorukha Gulab Khas’ embroidery while the technique is Kani. The dual aspect feature of the Dorukha, as the name suggests, is two sided and can be donned either ways. This lot is assembled from 3 different shawls and features a variation of both small, as well as scaled butas on floral mosaic background. The design structure is based on the Badamdar Kani Embroidery technique. The shawl also has plain Khudrang pallavs with fringes incorporated. The outline of the butas is created with a contrasting brown thread which elevates the presence of the butas and demarks its existence from the sprawling underlying motifs. The outer most border is that of a slim strip of green which efficiently contains the visual movement of the present lot. In this shawl, there is an intricate embroidery sprawling outward from the black sun star motif weaved at the center of the shawl. It is covered with various motifs ranging from paisley to almond shape to delicate buta motifs along the border. The striking and balanced colour palette defines the visual appeal of this shawl, contrast of red, black and white grabs instant attention. This particular shawl meant for women, has been cut down from a king size shawl and the borders have been incorporated from a different shawl, also observed is the incorporation of a plain Khudrang pallav. There is meticulous Kani embroidery done all over the shawl. The dominant design used is the paisley motif which is considered important in the gambit of Kashmiri textile tradition. This lot is a Pashmina dorukha shawl which means it can be draped either way. There is fine embroidery done on all four sides with a plain cream field. 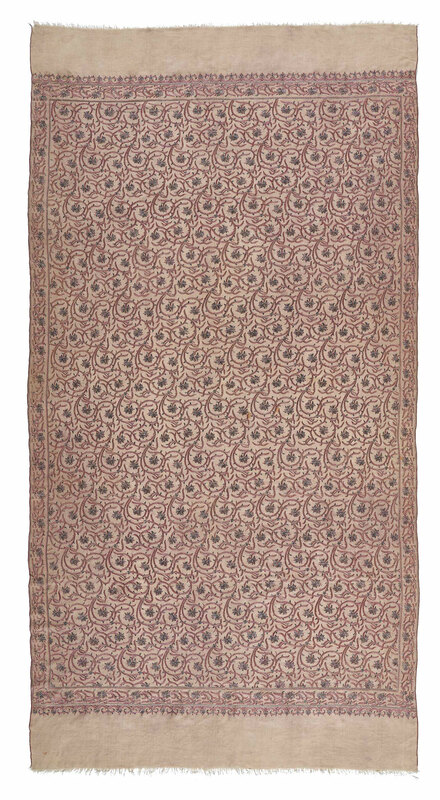 There is a Palm leaf motif on the four corners facing the centre of the shawl that establishes the design presence of this unique motif. This Dorukha shawl has embroidery work with various floral motifs covering the entire field. The Dorukha work has been executed with accurate mirroring form, in the style of Hassan Quli design. The thread used for embroidery is a rich black woven on a yellow ground. Borders all sides, with no additional pallavs. 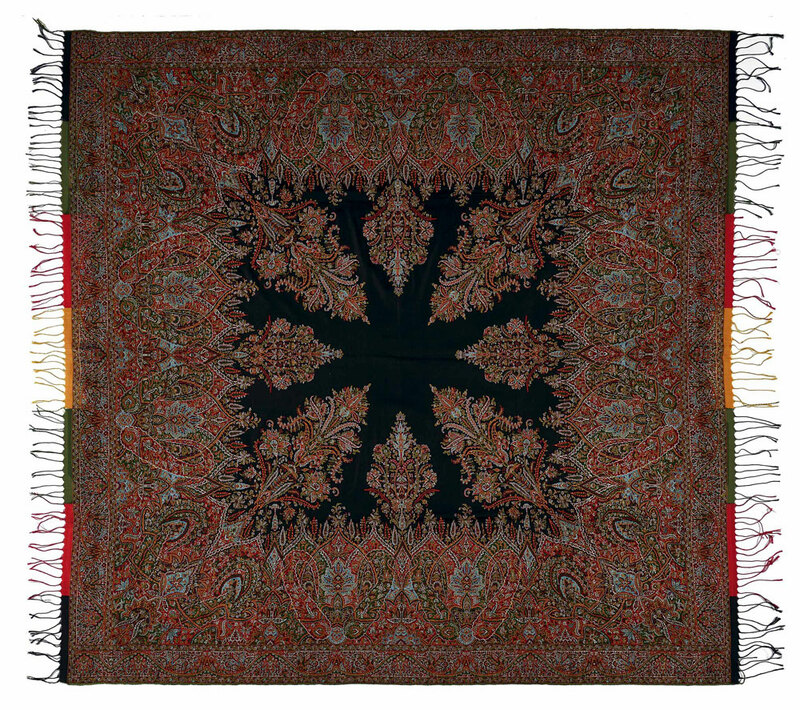 In this shawl, there is an intricate embroidery flanking outward from the black medallion weaved at the center of the shawl. It is covered with various motifs ranging from paisley to almond shape to delicate buta motifs along the border. The striking and balanced colour palette defines the visual appeal of this shawl, contrast of red, black and white grabs instant attention. An elaborate Kani weave with paisley motif incorporated extensively in the piece. In this shawl the decorated borders at the end of the shawl are broader than those at the sides. The paisley motif is intermingled with other floral motifs throughout the piece. All-over patterned field with deep pallavs and large butas against abstracted floral background. This shawl is cut from a single complete shawl as originally designed, though probably woven in several pieces joined with invisible seams. Categorized as Post-classic, the primary design element consist of two large spherical paired butas in the centre field. The technique is that of Kani. This shawl was created as a single piece and has a large section dedicated to the black embroidery work. The borders are streamlined and compartmented in order, while the surmounting area of the black field has symmetric abstract motif iconography as its primary inspiration. The fringed ends induced a aura of Bohemian to the shawl’s overall effect. This particular shawl has Sozni embroidery done all over on a cream ground. The cream ground cloth compliments the embroidery threads of black and red used to create the floral swirling design on the shawl. This particular type of Sozni embroidery is known as Jaaldar because the embroidery sprawls and permeates the entire surface field. The colour composition reflecting in this work defines revelry and the importance of such shawls. The multiple butas of floral background and the applied Kani technique are important aspects of Kashmiri textile traditions, which have been captured by the artisans through this work. The tan centre field is void and imparts space and are for the surrounding motifs to resonate to the surface, however the penetration paisley motif incorporated at the four corners of the field is unique. The pallavs are heavily ornate with multiple motif, while the field’s borders are executed as elongated strips.